British people have a reputation for talking about the weather and after a bit of sunshine in early Spring it doesn’t really surprise me. In the last week I have been appreciating some of the little things, the simple things, and my mood has undoubtedly been helped by a little sunshine. Is he pouting for the camera? Little and I have had a nice time just wandering to the local shop and looking at all the flowers on the way. We had to pause at numerous front gardens to see what was blooming, Little would pretend to smell them, I would ask her all the colours she could see. I even taught her the names of daffodils and dandelions, but she thinks they are called “Daddy Lions”. While us adults might dismiss them as weeds, the bright yellow dandelion flowers were just as much fun as the popular daffodil, and that’s before they reach the dandelion clock stage. 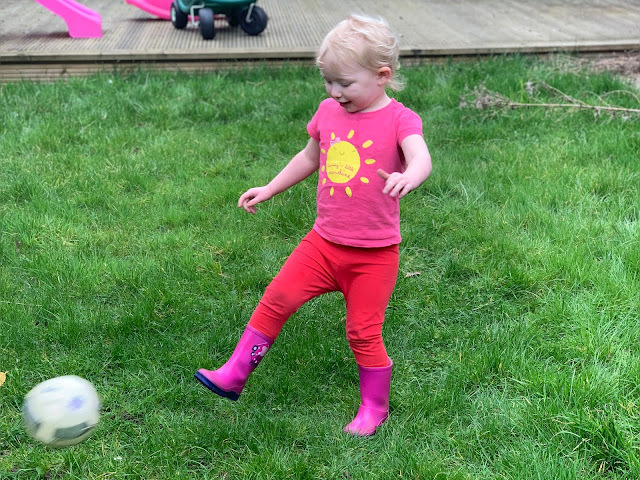 On another day Little and I played football in the garden while Baby Boy slept in the sling. She’s getting good at kicking the ball and sometimes she even managed to get it past me. One of the things I miss most in the winter is relaxing in the garden and letting my children play so it has been lovely to get out there again this week. I even got G to cut the grass. 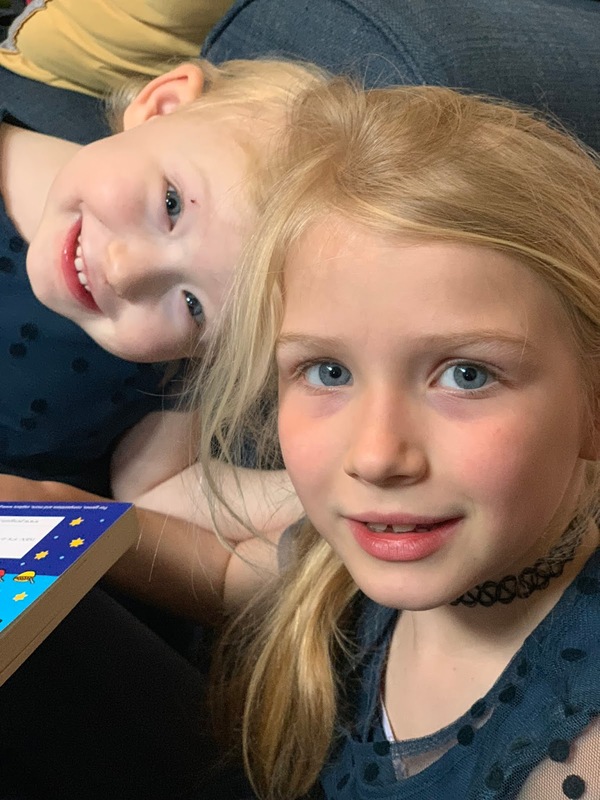 Little and I have been having good chats this week too, her language has taken another leap this week and it feels like she is trying to use as many words as possible. Instead of saying a short sentence she will say a much longer one and it’s making us all smile. I love hearing what she has to say and seeing how her thoughts are developing. I went with the Difflam spray which I bought over the counter at the pharmacy. I struggled to spray it in the right place and it didn’t seem to do much for the pain, but the next day my throat felt much better so it looks like it worked. 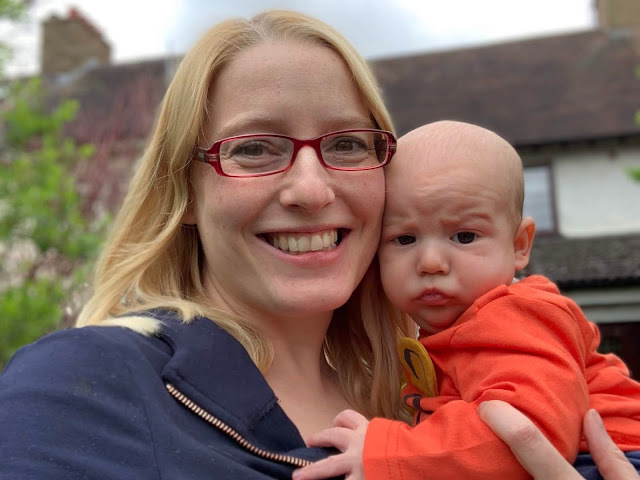 I think it would have been easier to gargle with, but it was good to be able to have something stronger than honey which is ok when breastfeeding. I didn’t spend much time working during the week because I wasn’t feeling up to it. I spent the short amount of time Little was at nursery relaxing and I didn’t stay up very late. I didn’t even post my daily Instagram photo on Saturday morning because I was so tired overnight and I didn’t have a photo I liked. Saturday night Baby Boy slept through the night for the first (and possibly last) time managing to go from 9.15 pm to 5am which was a nice surprise after hourly wake ups for much of the night before. This meant I was rested enough to post as normal on Sunday morning. I did receive a few deliveries this week, the most exciting of which was from Konfidence who we are working with this year as ambassadors. 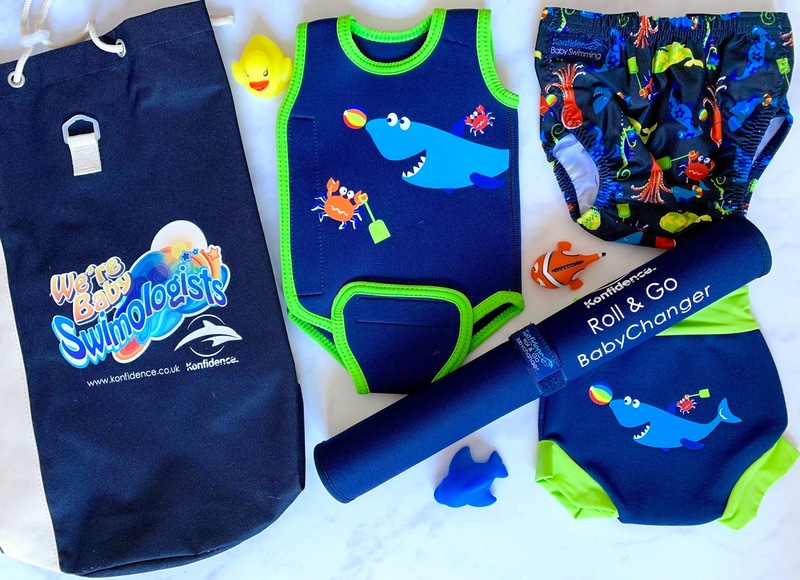 Baby Boy is going to be starting swimming lessons so Konfidence sent all the kit he needs for that including a neoprene changing mat, a babywarmer (swimsuit that keeps babies warmer), a neoprene nappy and an aqua nappy. Double layering with these nappies means you don’t need to use disposables and it prevents leaks. They also kindly send some bits for the girls including a swim jacket that Little is obsessed with and puts on everyday. If you want to buy anything from Konfidence use my affiliate link or enter my code (AFFILIATE-4503-EC4RA-AAPD) and you can will get a 10% discount from the Konfidence online store. I also received a selection of gold plated jewellery to giveaway from Newbridge Silverware and a copy of 5 Second Rule Junior (affiliate link) which we will be reviewing (and giving away a copy of too). On Friday we went to IKEA and I had a great time. My plan was to put Little in the creche for an hour while I picked up a couple of things I wanted, but when we arrived there was a sign saying it was closed. I decided we would wander around the show homes and then get a snack in the restaurant. Little has fun spotting the next arrow on the path and then when we got to the kids' section at the end Little spent ages playing with the play kitchen. It made me feel bad she doesn’t have one, I had considered it in the past but due to lack of space went for a mid kitchen instead. I’m glad she got the mud kitchen, but it often requires an outfit change after play so she doesn't play with it that often. Before going into the restaurant I thought I would just check the creche and I discovered it was now open. I registered Little because she hadn’t been before and then left her for an hour (it’s free!) while I went around the market place. I would like to claim I only got the items I went for, but it’s IKEA so obviously that didn’t happen. 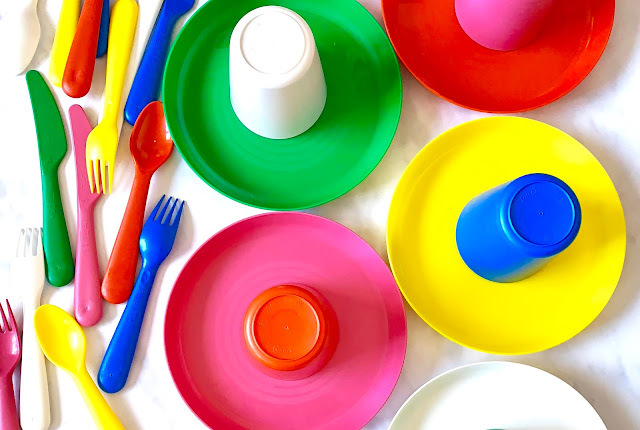 One of my purchases was some new plastic plates from the kids' section, but I was horrified, shocked and generally just miffed to find that they are now opaque and different colours. At least they are the same shape (I remember the last time they changed when it was the shape they switched). It’s going to take me a while to get used to it and speaking to other parents I’m not alone. IKEA what are you doing to us? And why don't we have purple anymore! Before leaving we got some lunch. It was £2.50 for a kids meal (meatball, chips and peas) and she got a free little bowl to fill from a selection of salads. I got cured salmon and a bread roll with vegan spread. By the time paid and were seated near the play area I was a bit stressed. Another mum asked if I wanted any help and she helped me get organised and feel better. It’s such a simple thing but it makes such a big difference having a friendly smile and a small chat. With 1 hour free creche, free wifi and a free cup of tea on weekdays I know we will be heading back to IKEA soon. Hopefully this time I will bring some self control. Music is hugely popular in our house and it has been worth the investment to get Amazon music so we can play a huge selection through our Alexa’s (we have 4: one in our bedroom, one in the girls room, one in the lounge and one in the kitchen/ dining room). I was admittedly woken up from my lie in on Sunday by M playing music, but she loves to constantly have music on. Little has always loved music too and I’ve had great fun dancing around the living room with my girls this week. As a bonus the bouncing and crazy dancing has helped calm Baby Boy in some of his fussier moments. The downside of M’s love of music is it has been the cause of a few meltdowns: one because we said we didn’t want music on during lunch, another because she temporarily lost her iPod and another because she wanted to listen to music on her Alexa but I was already streaming music on another device, I can’t afford the next level up subscription for the rare times we want to do that. Music helps calm her too so I guess it balances out. I don't have much planned for the week ahead, but with a little more sunshine forecast I'm hoping we will have some more happy times outdoors.